You probably don’t have lions or cheetahs in your backyard, but how about small wild cats? Bobcats live in almost every state in the U.S. so you just might have one as a neighbor. These small cats have short, bobbed tails, which is why they’re called bobcats. All About Bobcats: The have short, bobbed tails, which is why they’re called bobcats. Bobcats have brown or reddish fur with black markings. They look a little like an ordinary house cat, but they’re a lot bigger. 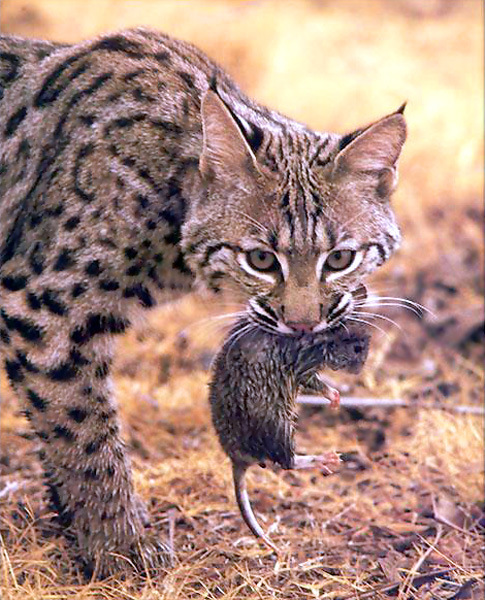 Bobcats like to eat rabbits, birds and bats. In the winter, they sometimes eat deer. And if a farm or ranch is nearby, they’ll steal a chicken, lamb or small pig from time to time. The main features all about bobcats. Of course, farmers don’t appreciate having their livestock stolen. In the U.S., bobcats are protected, but Mexican farmers trap, poison or kill bobcats to keep them off their land. Bobcats live almost anywhere. They live in forests, mountains, woodland areas and deserts. Bobcats quietly sneak up on prey and then pounce! Bobcats live alone except when they mate. Each bobcat has an area of land that it protects. Other bobcats avoid this land. Bobcats have one main den in their territory and several smaller dens. The main den is often in a cave. Smaller dens might just be a few rocks or an old tree stump. A video documentary about the characteristics and behavior of bobcats. Question: How many kittens do bobcats have at once? Answer: Usually between 1 and 3. 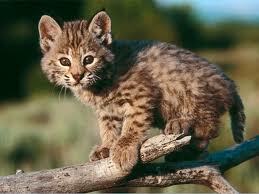 Question: When do bobcats have kittens? Answer: Usually in the spring. The kittens stay with their mothers until the fall. 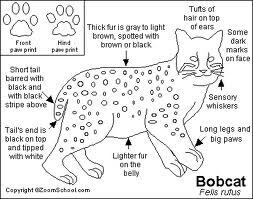 Enjoyed the Easy Science for Kids Website all about Bobcats info? Take the FREE & fun all about Bobcats quiz and download FREE Bobcats worksheet for kids. For lengthy info click here. Declan, Tobin. " Bobcat Fun Facts for Kids ." Easy Science for Kids, Apr 2019. Web. 23 Apr 2019. < https://easyscienceforkids.com/all-about-bobcats/ >.